Happy Hive was conceived with the idea of a community that closely collaborates with each other in an environment that can foster creativity, learning, and productivity. The term “hive” was derived from the concept of beehive where worker bees intrinsically work alongside each other to contribute to the survival of the colony. “Happy” is a word that embodies the culture and atmosphere of the company to provide healthy growth and a balanced life for personal and professional development both for employees and clients. Helping fellow entrepreneurs focus on their chosen profession and enterprise by providing support services makes it possible for Happy Hive to inspire others to also redirect their priorities to more important matters in life such as family, friends, health, and life in general. 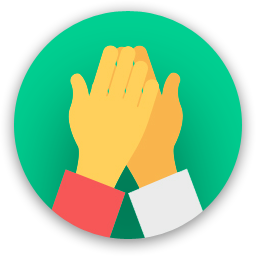 The collective experience and competence of each team member of Happy Hive enables the company to aid in the formation, survival, growth, development, and eventually, in the success of each community member. To motivate collaboration among members of the community, Happy Hive provides coworking spaces for students, freelancers, and startup companies where there’s always room for imagination, resourcefulness, play, and laughter. We live, we play, and we work. That is what Happy Hive is all about. Are you a member of Happy Hive? "As comfortable as you were at your own home." Visiting Happy Hive was my first time to visit a co-working space and I was really amazed by the place, it was like I am just home. The owner was so accommodating and friendly. PLUS! You can bring your kids and pets here! 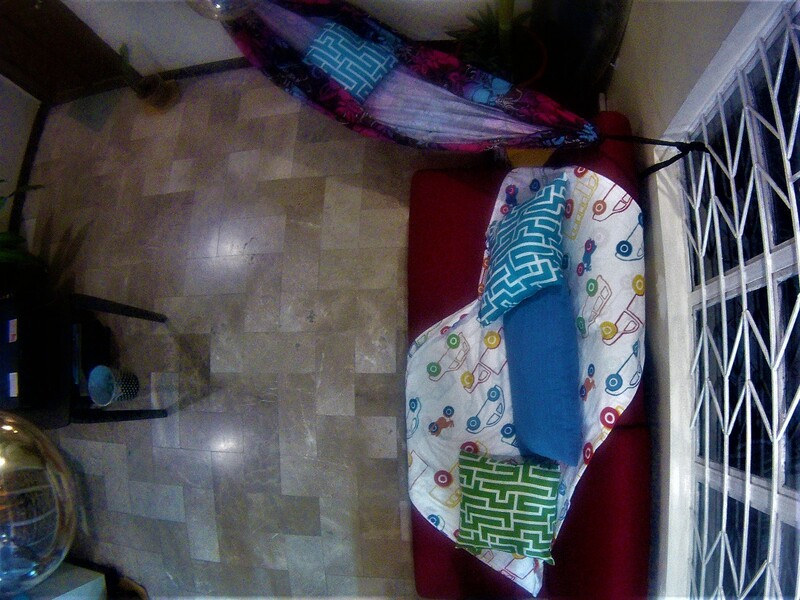 The place was quiet, spacious and comfy so you can be more productive. Their internet connection was great. This is perfectly suitable for students, young professionals, company meeting, Freelancers. Most of all they offer FREE COFFEE!!!! I would love to visit Happy Hive again with friends and I highly recommend this place to have the hive and be happy with HAPPY HIVE! I feel happy and relaxed the first time I'm at Happy Hive. I was amazed to know that there's a place like this. It's very nice and clean. Everything in the area are organized. It feels like you're in your own home. Good to know that you can bring your kids here. The ideal venue for working, meetings and other events. Planning to bring my kids and sister on my next come back to Happy Hive. WiFi connection is very good. I'm thankful that the rate is very affordable. The owner is a nice person, she is very accommodating. I will recommend this place to my friends. "I found a HOME! If only the place is nearby to our area, i would love to go back every single day bringing my son with me. The place is not only intended for working but to feel HOME. H - Heartwarming; Mommies who manage the place are heartwarming ind"
If you are a mom who want to work because you are a bit fed up working from home and put up an event, go to Happy Hive. The place is peaceful, good for your kids to play as well, the place where you can make your own coffee (coz i love coffee). The managers of the place are approachable and heartwarming. They make you feel independent and trustworthy while staying in their place. I found peace and joy while tapping my laptop because the network connection is also awesome. The area is clean and you can rest if you want. 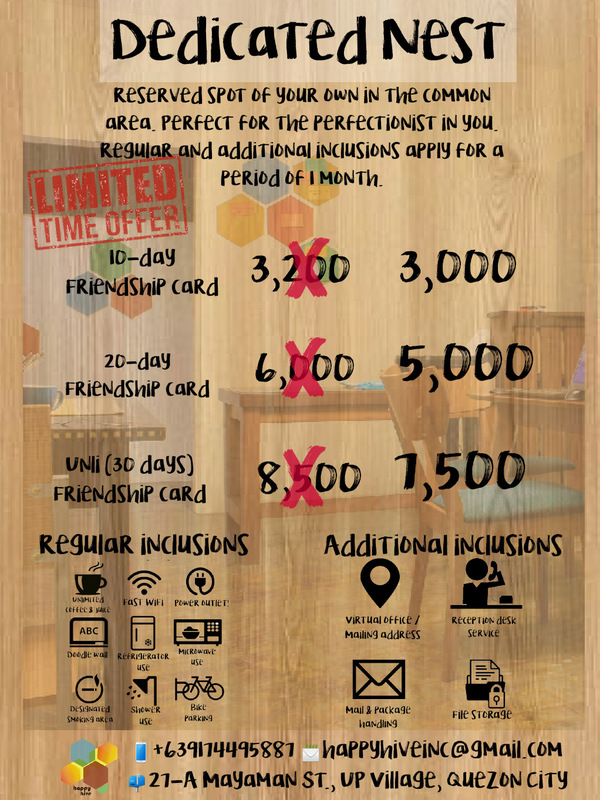 Wow, very homey feels, I'm really surprised to discover a unique coworking space like Happy hive. 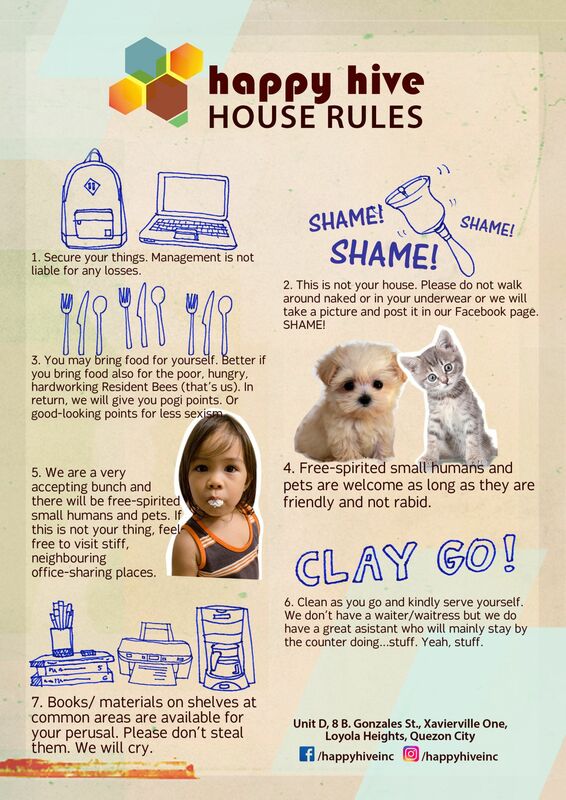 It has its own vibes of positivity with the best house rules! I really enjoyed attending training event here. People coming from different walks of life can discuss and connect with each other. The staff are very accomodating. I also appreciate the following. ✅ Cost ✅ Access to internet ✅ Convenience ✅ Ambiance ✅ Meeting/ board rooms ✅ House Rules ✅ Food Definitely, I will recommend this place to my family, friends and colleagues. A fun experience here at Happy hive. Congratulations and kudos to the Owners! Stay blessed at Happy Hive. Unlike other co working space where there is an office-like or study room atmosphere, Happy Hive makes me feel comfortable and like home. It is kid and pet friendly. It is budget friendly too, so students can also go there if they want to review for their exams or do their homeworks. Snacks are also available so getting hungry while catching up for the deadline is not a problem. There is only one thing i had issues with. Quezon City is a huge city and if you are not familiar with the area, even if you live within the city, finding the exact location may be a concern. "Happy HIVE a Happy PLACE"
Happy Hive is Happy place. The ambiance is good and clean . This is the place where you can set a peace of mind and focus because of its aura..The good service and very good internet connection is exeptional or better yet , Ask Diego , Lol... plus plus plus, I would like to commend their place wherein patronizing small business especially local products and the Honesty Store. I like also the place its homey, that you can feel you are in your own home. Pets are allowed if you need a buddy ..and a place for a kids . The ambiance is very homey. Like you are studying and working inside your home. Very affordable. Not to mention the affordable price, 50 pesos per hour. Accessible, there are nearby shops and restaurants. 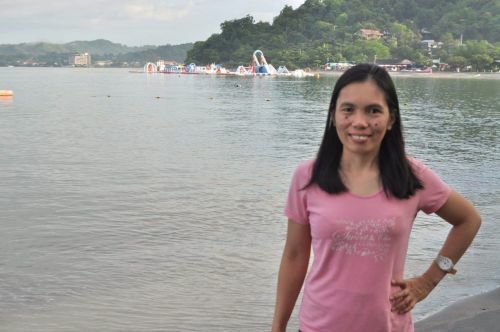 A perfect place for students, work-from-home moms, freelancers, and professionals. The second floor is perfect for meetings, trainings and seminars. The owners and staff are really friendly, even the little boy messenger (son of the owner). Internet connection is good. We had our training here, with FHMoms. Coffee lover? No problem. They offer free coffee. Pet lover? No problem. Even your pets are welcome. :) Definitely a Happy Place. Bee Happy! I love the homey ambience and set-up. I love how I can work and bring my son with me. I'm sure he'll enjoy playing with Diego while I can focus on my job. By the way Diego is such a darling. Don't be fooled by his age and size, because he offers great customer service whether it's serving you bananas or making sure the meeting room's door is kept cl d ed. 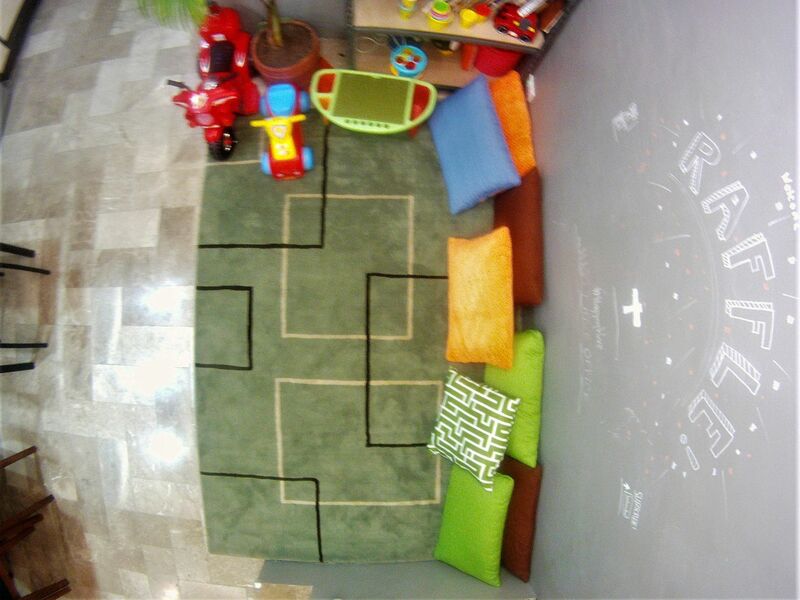 There is ample space to work, stretch out and even have a play break with your kids. 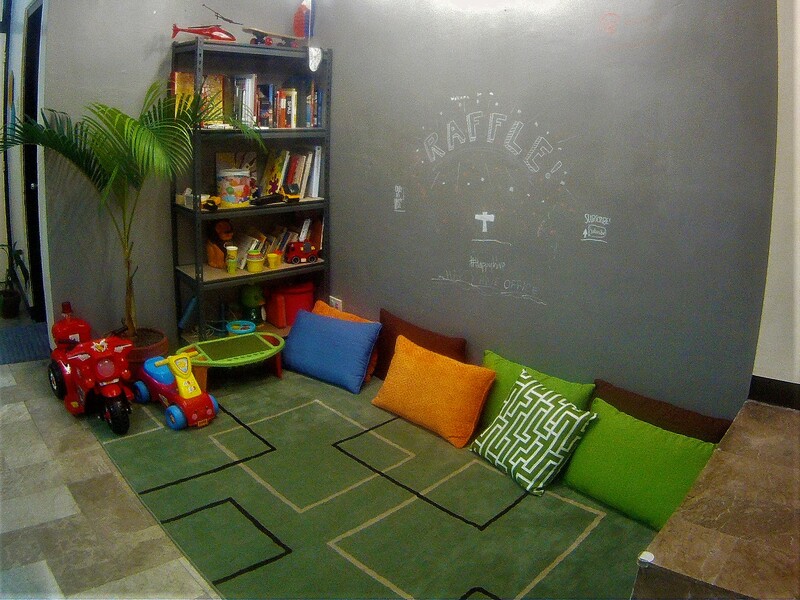 This is perfect for moms who wants to stay productive but longs for the comfy reassuring sound of happy kids. At first it was weird because it is my first time see and experience the co-working space. And I must say that it's refreshing. Not only you can work outside of your comfort zone (at home) but you can actually connect to other freelancers within The Hive. It feels like homee and I really like the cozy feeling inside. Plus a high speed internet and a bottomless iced-tea. Seriously, I like the concept of working outside home and corporate offices. A nice experience. Will definitely recommend this place to my family and friends. Looking for ore FHMOM's training here at The Hive. The atmosphere in Happy Hive is very conducive to working. My colleagues and I used their conference room and it’s really helpful that they have reliable high-speed wifi, and a big TV for presentations and/or Skype calls. You will leave the place feeling productive because the environment you were in helped you to stay focused. The place is also clean and well-maintained. The staff were courteous and friendly, and the owners were very accommodating of our specific requests. On top of that, they have free-flowing coffee and juice which we all appreciated. Highly recommendable. Will definitely be back here in the future. "You just HIVE to BEE here!" Happy Hive truly stands for the vision it claims to have. Although most of the people here are working professionally, I was given the same hospitable welcome by the lovely team behind it. This place is BEEyond outstanding for those who need a place to work and study in. You cannot imagine the boost in productivity level you'll have when you work in their coworking space! It offers an ambiance that is a healthy mix of fun and focus- truly something out of the ordinary. Want food? There's a kitchen! Want coffee? Their coffee is amazing AND IT'S FREE! Running out of battery? There are sockets EVERYWHERE! You can even bring your pets (as long as they're not rabid) along with you! You can work, eat, rest, and play! They even sell craft beers if you feel like rewarding yourself after a tiring day! Happy hive is built on the character and values of its members. It's clean, kind, responsible and accommodating. You'll really feel like you belong and contribute to the development of the community just as the community helps you grow to your full potential. 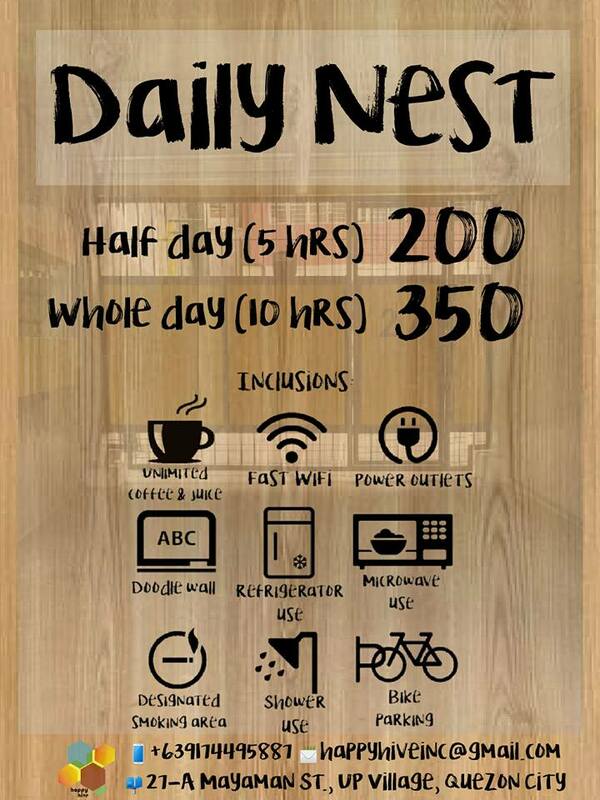 Happy Hive is beyond your ordinary charging station with coffee; it is a place that empowers minds and fuels passions! Not you ordinary co-working space, Happy Hive provides a sense of community among start-ups, freelancers and other professionals who wants to work at peace but still feel at home. 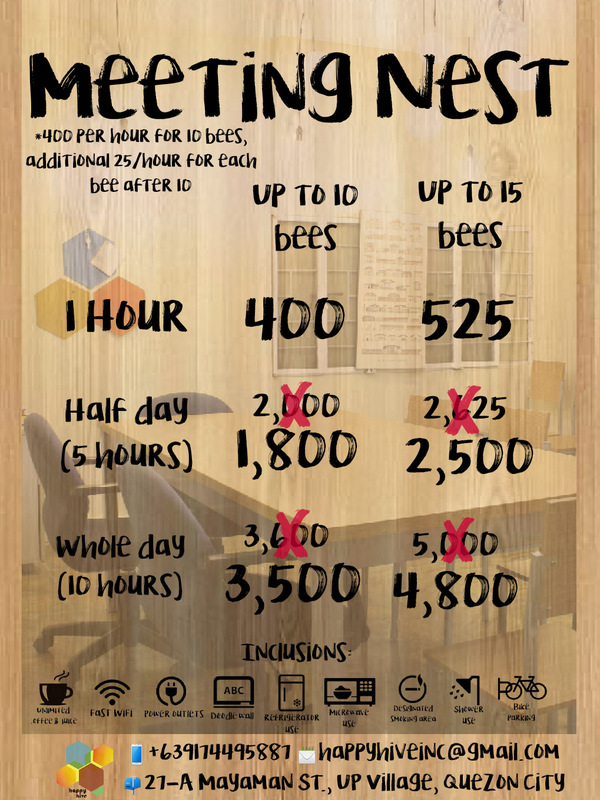 Happy Hive provides good working areas such as big desks with comfortable chairs and meeting rooms. The internet connection is good and there is a printing service. You can use the kitchen for heating your food. Also, free brewed coffee is provided. Kids and even pets are welcome here. Get together parties, free seminars and product presentations are also hosted by Happy Hive which is a big plus. Value for money at its best. 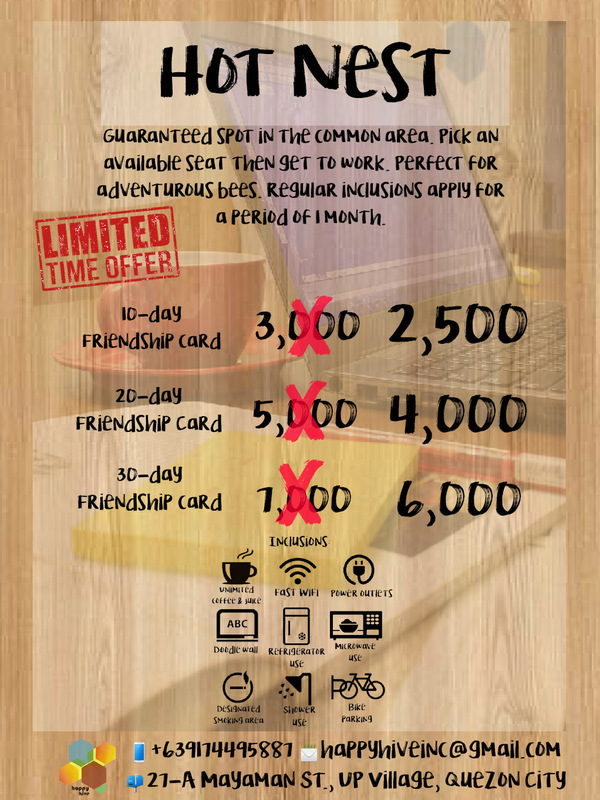 Happy Hive is not your ordinary co-working space with stiff/serious environment since the place promotes a sense of community where guests are encouraged to interact, share ideas and even food! Happy Hive also offers free seminars to its guests! Management is open to the suggestions and willing to go the extra mile just to cater the needs/requests of the guests. They also offer accounting services, permit applications so it's really a one-stop shop ideal for freelance workers and start-ups. 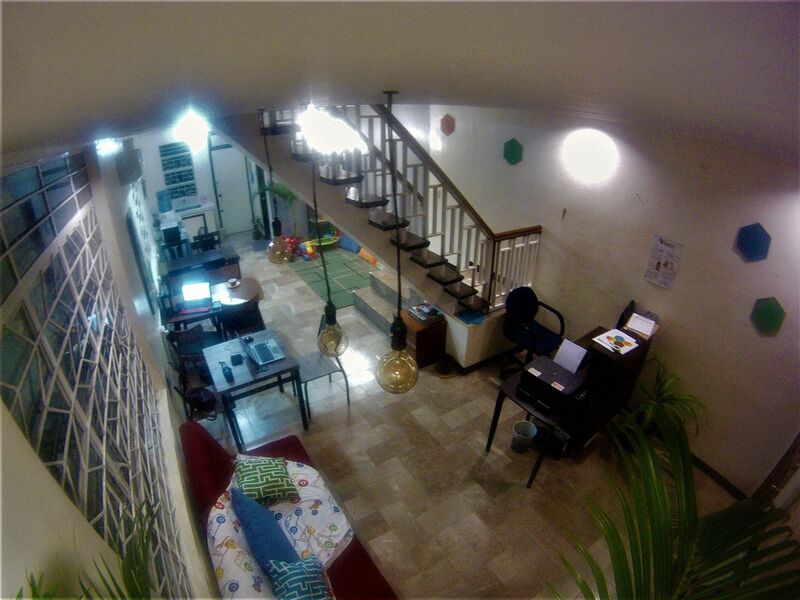 The place is very accessible, located in the heart of QC, and parking is very easy. It's also pet and children friendly! Highly recommended! The perfect place for young professionals in Quezon City. 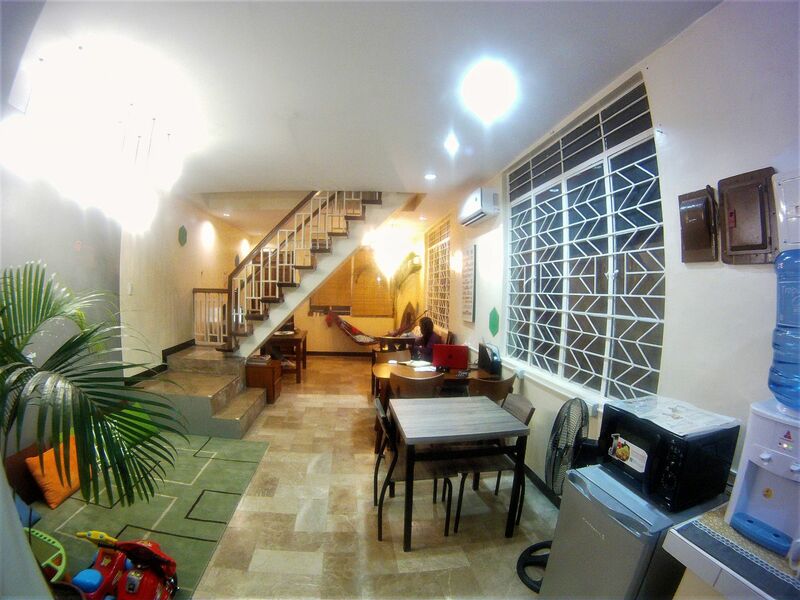 It is very accessible with nearby restaurants and a quiet neighborhood. 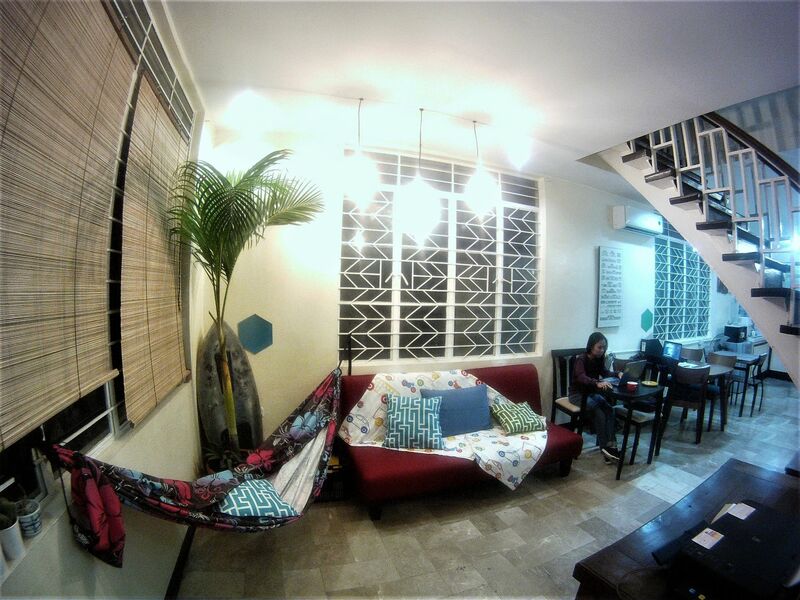 The place is very cozy where you have your choice of work space from the quiet meeting rooms in the 2nd floor to the happy social space in the 1st floor complete with a hammock and couch area. Coffee and juice is free with assorted snacks and beer also available at happy prices! An added bonus would be complete amenities and the big collection of architectural books for practicing designers. A highly recommended work place with speedy WiFi to boot! "Amazing Coffee Work Place for Designers"
This place is great for designers, there are so many books you can read for reference and inspiration plus the people here are so eager to help you out be it in design, construction, etc. The tables are also big and being a person who takes up a lot of space, I really appreciate that. They even have a designated smoking area outside when people get too stressed with work. Lastly, they have the BEST coffee. I have become a frequent visitor here and I look forward to tasting their coffee every morning and did I mention they were free? What more can I ask for. "Living up to the adjective in their name"
I am an occasional co-working bee in this wonderful place called Happy Hive as I am a freelance architect. I visit project sites a lot and when I don't, I am either in dreamland, sleeping comfortably in my apartment, or I am in Happy Hive. This place suits whatever productivity mode you're up to. If you want an isolated and peaceful spot (as in super duper quiet), you can station at their work (or meeting?) soace upstairs. Yes, they have a second floor with two beautiful rooms that are like semi-private. Just don't do anything silly in those rooms, okay? If you're into a small chitchat from time to time, you can set-up on one of the seats on their main work areas on the ground floor. This is personally my favorite area. They even have a couch and a hammock area! Now where is "happy" in all of that? It's in the people. The owners and staff are really friendly. The said people are also very creative so expect a couple of gimmicks every now and then. You can bring your pets, kids (if you have one), partner (don't rush into the meeting rooms ok? ), clients, anyone and anything. The regulars in this place are a bunch of literally happy architects. Curiousity always is a virtue in here and during breaktimes, you might catch them watching random stuff on youtube (animals, food, circumcision, all sorts of stuff!). Feel free to join and discuss with them whatever the topic is and I'm sure you'll leave the place happier than before you came. PS: Fiber internet is fast and I've heard they will be upgrading again soon. They also have free juice and coffee. And they're unlimited! "It has everything you need, and more." I bike to almost everywhere, and the fact that the place has a secure bike parking area and shower is already enough of a come-on for me. And the toilet has a bidet. 'Nuff said. If you want all the comforts of home but also need a conducive working environment, Happy Hive is for you. I brought 6 of my groupmates over. They were very pleased and couldn't wait to go back. There's real (brewed) coffee and other drinks for everyone to share. They have all you need to be productive - extension cords for multiple gadgets, a blackboard for brainstorming, fast wifi, and adequately lit work areas. We ordered pizza from outside, so we appreciate the fact that they also have utensils and cups ready if you need them. Had a wonderful experience at the Happy Hive. It’s located in a quiet spot so it was very conducive for the online meeting that I facilitated. The Internet connection was also fast to support video calls. Didn’t have any lag or disconnection all throughout my stay. Even had a smooth Mobile Legends gaming experience during my break. The sofa where I sat was very comfortable. The lighting was beautiful. The owners were very friendly and accommodating. Most importantly, they have a smoking area where you can take your free coffee or juice with you! I would definitely visit this place when I’m back in QC. Happy Hive is the perfect place to work. If you're looking for a well lit and quiet place to finish your papers or study for an exam, you have reached the best place to do so. You don't need to worry falling asleep and end up doing nothing because Happy Hive offers unlimited brewed coffee! Or if coffee does not help you, why not hit their shower to wake you up! Yes they offer a bathroom where you can freshen up yourself and be back on track. Wifi is fast too as fast as a lightning! Thank you happy hive! Ambience is so chill. I can't wait to bring my officemates here for collaborative work. :) The free use of shower and the available bicycle parking is really great. I can shower after biking to Happy Hive. The free use of microwave and fridge is also superb so I can just bring in food, put it in the fridge then reheat it later. Awesome. :) Unli coffee with wifi and outlet use are great perks at the price rate. Also so nice that I can bring my fur babies if I don't want to leave them at home. Such a great idea to package these amenities... Good job Happy Hive. Offers the essentials to make your time there creative and productive. The atmosphere is relaxed and homey. "Happy at Happy Hive! " A great place to get work done and all-together, also a great place to meet new people. Great service, great people! "Cozy place with fiber connection "
Its the place you'd lile your real office to be. Snappy fiber internet. A cozy hammock corner. Real coffee, not the crap from the vendo machine. Child friendly and pet friendly. Perfect spot for building on your big ideas. It's easy to settle in at Happy Hive . Good people accompanied by a warm atmosphere. It has everything you'll ask for to be productive. The environment is very cozy yet conducive for productivity, with good wifi connection and great coffee. They also have amenities like bike parking and showers. The community/ people are friendly and I learn a lot from them. Plus, the location is very accessible, there are nearby shops and restaurants. Definitely love working here!! "There's a reason it's called "Happy""
"Perfect place for creative productivity"
A coworking space that focuses on the community. I can bring my 2 year old toddler here to work and be productive and be a mother at the same time. Very inclusive and accommodating. A healthy environment where you can be productive. More accessories at the bath room please; like tissue, hand soap; etc. All the rest are good. There should be a designated kids corner coz children running around and making noises may disturb customers who are not used to work and concentrate with such distractions. Feel free to get food from the "honesty pantry". Just keep track of what you ate and pay accordingly. A great spot to eat. a place that empowers minds and fuels passions! There are nearby places to eat but it's always better to bring your own food! they have street parking outside and accessible to a lot of places! Happy Hive will be in touch with you soon to confirm. 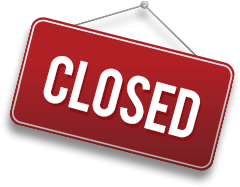 Happy Hive has received your membership enquiry and will be in touch with you soon.